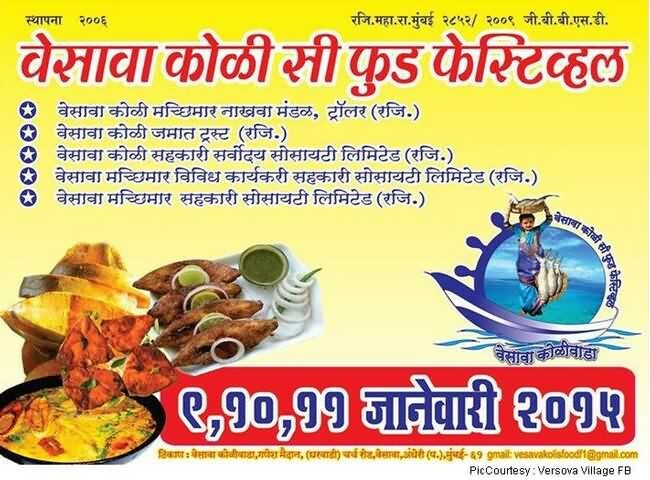 “Annual fish festival 2019 (Dates Below) at Versova koliwada village located at Andheri West, Mumbai suburb on western railway route is an magnetic event attracting fish and seafood lovers around Mumbai. Since 2006, 2007 this fish festival attracts 20 to 30 thousand people to this fisherman’s village of versova (Also called ‘Vesave’). It is another fish festival event like one held yearly at worli koli village. If you are already a die heart seafood lover you might be knowing about this fish names which will be served to you at cost ranging from Rs.50 to Rs.100 to Rs.150, Yes at these cheap rates you can enjoy fresh fish and crabs dishes in special spicy koli masala, catch just 2 hours before serving. Its a regular Maharashtrian food, But little different as its a special seafood from our own versova beach. List of all fishes served at this fish festival is varieties of about 15 to 20 different fresh catch fishes and crabs, Some of them named Bamboo ka bombil (A Dry fish), Tangy, King Prawns, Pomfret, Lobsters, Bombay Duck (Named after Formerly Known Mumbai as ‘Bombay’), Tuna, Pink Colour Queen fish known as Rani by Local Koli’s, Surmai, Golden Anchovies which is called Mandeli, Basa, Shellfish, Mackerel, Ghol and Other varieties of Crabs etc. Here is and article about Maharashtrian cuisine detailing speicla marathi style dishes at special restaurants. It is worth the excitement of eating fresh meat at such reasonable rates and enjoying the cultural festival with special koli dance on the foot tapping songs. Every feast stall has the authentically dressed koli women preparing about 1 ton of fresh fishes daily for all these 3 days of festive event at Versova. Observe the way this people dress as the koli style is bit different in saree dressing style that looks awesome with golden ornaments. Typically the authentic koli saree is of green, orange and yellow colour. Every fisher woman in festival will be seen wearing such costume as the fisherman community need to dress according to the comfort of catching fishes deep inside Mumbai’s Arabian sea and similarly the equal amount of hard work wife puts in to make the meal or ready it for sale. Right from food, the masala used, the village itself, the unique culture of dance and songs, you will get a complete package of fun, feel and feast at this one place and 3 days event called ‘Versova Fish Festival. Delicious fishes made in special koli masala with soul kadi and there is always an option for desert like Kulfi, Other Ice Creams and Paan. Below are the fishes on menu. Stuff Pomfret tops the list as it is all time favourite of everyone. Bamboo ka Bombil (Bombay Duck). Other fishes on list are Tuna, Surmai (Queen Fish), Basa, Teesrya (Shell Fish), Bangda, Mackerel, Squid, Ghol, Rawas and Crabs too. By Auto / Cool Cab etc : Private Auto from Andheri (West) directly to versova village which can take anywhere about 30 to 40 minutes depends on traffic conditions. By Bus : Bus No. that goes from Andheri station and other locations towards versova village are 32, 56, 210, 221, 222, 249, 234, 251, 255 and 328. By Mumbai Metro Trains : Best and easy way to ignore traffic and confusion is to take Metro from Andheri station (East Side), get down at last stop which is Versova and take a Private auto / Walk for few minutes. By Local Trains : Get down at Andheri Station (West Side) on Western Railway Route of Local trains. See railway map for local & metro train routes.